Before we get to the main story, a comment on the market’s increased volatility of the past couple weeks, which is likely front and center in the minds of most investors. We do not know for sure what caused the market to reach an all-time on January 26th and then tumble into correction territory a mere 13 days (nine trading days) later on February 8th. For those unfamiliar with the definition of a market correction, a 10% market decline is typically referred to as a correction. At this point, it is far too soon to know if this correction will turn into a bear market (generally viewed as a 20% drawdown). While corrections are normal (occurring about once a year), investors may have become somewhat complacent given the market’s low level of volatility in 2017. We have also never gone from an all-time high to correction territory as quickly we just did. However, the significance of the 1,000+ point drops the Dow Jones Industrial Average experienced twice last week, is much less in percentage terms with the index over 20,000 than it sounds. Such large drops might be uncomfortable to see or experience, but they should no longer be viewed as unexpected. It could even be considered quite healthy to have the market fall the way it did. After two years of seeing stock prices rise steadily, for the most part, it is reasonable to expect periods where the markets cause worry and turmoil for investors. Longer term, the economic fundamentals remain positive. For the first time since the great recession, every major world economy is expanding. While this could still be the beginning of a bear market, these factors should help investors maintain a more positive view. What is it that leads one to adopt a certain profession? Sometimes it is because of our role models growing up. It could also be just the opposite, we see bad examples of certain types of behavior and want to do what we can to avoid repeating it. In my case, I think it is more of the latter than the former. In an earlier post, I described my experience getting in and out of credit card debt and how it factored into the decision to start Apprise. More broadly, much of what I saw in my home growing up (or in many cases learned later when I could better understand what truly happened), drove my interest in personal finance and the importance of saving and investing for the long term. My enlightenment about the true nature of what happened in my home growing up, so to speak, really started on April 2, 1990. I remember the day well because Duke was slated to play UNLV for the NCAA championship that night. It wasn’t much of a game, as we got totally waxed, losing by 30. (Fortunately, we got our revenge the following year, as we ended an undefeated season for UNLV on our way to the first national championship in school history). I had been looking forward to the game, especially because a friend who was later the best man at my wedding, was a big UNLV fan (his father was a professor there), making the game for bragging rights, so to speak. Unfortunately, earlier on the day of that big game my mother was diagnosed with the breast cancer that ultimately led to her passing a little less than two-and-a-half years later. Needless to say, that news dampened my enthusiasm for that game. After my mother’s diagnosis, the full truth about my parent’s personal finances started to come to light. I knew that they had not saved much for retirement, that my father was often late paying his bills, and that obtaining credit was often an issue. There were also calls from creditors looking for money, and times where our electricity or cable TV service shut down temporarily. But, when the bills started piling up after her diagnosis, we learned a lot more. The payments on the mortgage were not being made on time, and the bank was threatening to take the house. Credit card accounts that had been opened by somewhat questionable means were overdue. There simply was not enough money to cover the bills. While current rates on 30-year mortgages at that time were in the range of 8%-9%, the mortgage rate on my parent’s home was in the teens. I know what my parents paid for that house, and while I do not recall all the specifics, I am pretty sure the balance at that time was higher than the original mortgage taken when they bought the house. I still remember going to the bank with my mother after all of this came to light. We opened a new bank account, so I could have authority to sign checks and manage the payment of bills as well as reconcile and review and arrange the corresponding payments related to all the explanation of benefits statements that came in detailing the cost of her treatment. Because of these circumstances, my parents had to sell their house to avoid foreclosure and move out of the home my sister and I grew up in. Since they could not get a mortgage to buy another home, they could only rent a smaller townhouse located about 30 minutes away. Not exactly what you want to go through when you are trying to fight a life-threatening disease. · Whether it comes from books, life experiences, or working with those who know, obtain some type of education about financial matters. · Spend within your means. · Pay credit card bills on time and do all you can to avoid carrying high-rate personal debt. · Stay current on your mortgage. · Have money saved for unexpected occurrences such as job loss or medical needs. · If you have children, put aside money to help pay for their educational needs. For me, it was important to get better educated about financial matters. This started with becoming a CPA – that occurred before my mother’s diagnosis. At the same time, it also included taking courses in investing and finance, so I could learn ways to make money from the money I earned and saved. Understanding accounting also helps you understand more about how to invest. In the first accounting class I took in college, we learned financial ratios that could be used to help assess a company’s financial health and strength. It also meant learning more about the world of income taxes. Ultimately, it also included putting in the work to become a CFA® chartherholder, so that I could better understand concepts related to investing, portfolio management, and personal and corporate finance. Unfortunately, most schools in the U.S. do not provide financial education as part of their core course offering. That is why part of Apprise’s mission is to help clients better understand the why behind the recommendations we make. We also know not everyone has the Knowledge, Interest, and Time to manage their personal finances on their own. In fact, KIT (or the lack thereof) may be one of the primary factors driving clients to seek a financial advisor’s assistance. When it was time to buy my first home, I was not sure whether I could afford it. While it sounds like a lot of work, I determined the best way to figure it out would be to chart all expenses. I carried a note card where I recorded every single expense – even as little as $0.25 for a newspaper (this was in the days before the internet). At the end of a month, I created a spreadsheet showing how I had spent my money. This exercise gave me the confidence I needed to go ahead with the purchase. I knew what expenses I could eliminate if money got tight. Today, you can do the same thing by saving your receipts and entering your expenses into a program like Quicken – I have Quicken records for my family’s expenditures dating back more than 20 years. You can also register for an account with an online service like mint.com. How have you reacted to the market’s recent tumble that saw the Dow Jones Industrial Average and S&P 500 Index both fall slightly more than 10% from the all-time highs reached on January 26th to their lows of February 8th? Are you afraid to look at your account to see how you it has fared? Did you engage in any panic selling? Did you buy more of stocks you like? Were you happy to sit by patiently and wait for some of your favorite stocks to fall to more attractive levels? While we define risk as the permanent loss of capital, we know that most associate volatility with risk. If your willingness to assume risk is high, you can allocate more of your portfolio to stocks. If it is low, you should generally allocate more to fixed-income investments or bonds. 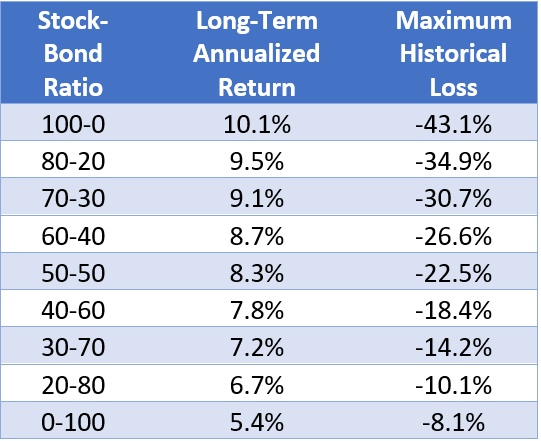 As you can see, while allocating more to stocks can increase your long-term annualized return, it can also increase your risk of loss. If you know that seeing your portfolio decline markedly will make you want to sell your stocks out of fear, then you would be better off with an allocation that is likely to result in smaller losses. The downside of this approach is that you may have to work longer, save more, or spend less (or some combination of all three) to increase your chances of meeting your goals for retirement. How Do You Handle Market Volatility? Your stock-bond ratio can also be referred to as your asset allocation (or diversification) policy. Asset allocation divides an investment portfolio among different asset categories, such as stocks, bonds, or cash as well as across geographies and market capitalizations. The decision as to what is the best mix of assets to hold in your portfolio is very personal. The asset allocation that works best for you can vary depending on factors such as your age, your willingness to tolerate risk. If we assume that future returns will resemble those we have seen in the past, we should invest as much of our portfolios in stocks as we can. However, as our stock allocation increases so does our risk of loss. If you were an investor when the great recession hit and caused the last bear market, go back and check your records to see how you reacted (trusting our memories does not always work, as behavioral biases may cloud our recollections). Were you still buying stocks in 2008 and early 2009? Did you simply hold onto what you already owned? Did you sell your positions in fear? How you acted back then may provide you with some insights into what you will do next time a bear hits, and how tolerant you really are to risk. Creating a budget, setting an appropriate asset allocation policy, and deciding how to save for your retirement are all essential elements of planning for your financial future. If you would like to discuss these issues with us, please complete our contact form, and we will be in touch.